Scottish Golf has been left in disarray just six weeks before a crucial vote on future funding for the governing body after Blane Dodds stepped down as chief executive to take up the same role at Tennis Scotland. With the 50-year-old having served as chair of Tennis Scotland, a voluntary role, during his 16-month tenure with Scottish Golf, the move has come as no real surprise, with Dodds admitting it was “the one job that I could not turn down”. The timing, however, could not be worse for Scottish Golf due to Dodds having publically fronted the launch of a new strategy aimed at bringing in much-needed funds to counter both Sportscotland support being slashed by £360,000 and sponsorship income decreasing. Last month Dodds warned that £400,000 worth of cuts would need to be implemented next year if backing wasn’t forthcoming from clubs and stakeholders at a special general meeting due to be held in early December. 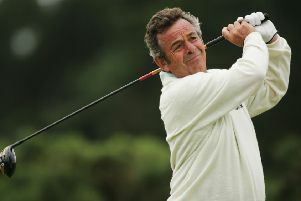 His proposals include the national affiliation fee, paid by every club member, being raised from £11.25 to £24, clubs having to sign up to both a customer management system and national tee booking system and golfers from abroad paying an international licence. One way or another, all have proved to be contentious and now Eleanor Cannon, the chair, has been tasked with trying to pick up the pieces, though it seems a watered-down version of the proposed blueprint will now be on the table at that upcoming meeting in Stirling. “The timing of this decision is unfortunate, but we acknowledge Blane’s long association with tennis in Scotland and the emotional pull it has on a former internationalist,” said Cannon of the man who succeeded the long-serving Hamish Grey following his departure 18 months ago. “However, the Board of Scottish Golf remains unanimously committed to its core strategic objective, which is to deliver significant investment to the game and provide a sustainable future for it – at a time when the government is significantly reducing its contribution to the game. “We will continue to engage with and listen carefully to golfers and clubs over the coming weeks, to underline our belief that by making a relatively small personal investment in the game, golfers can help strengthen the foundations of this great sport and better serve future generations of golfers and visitors to Scotland. Eyebrows were raised about Dodds retaining a role in tennis at the same time as being in charge of the unified body running amateur golf in Scotland and a statement issued by Tennis Scotland on his new appointment will merely have added to concerns that the arrangement caused a conflict of interests. Dodds, who was previously CEO with North Lanarkshire Leisure Ltd, does not take up his new role until 3 January, so is staying on at Scottish Golf for the time being to assist with the handover. “I would like to thank the Board and staff for their dedication and un-wavering support during my time with Scottish Golf,” he said. “I leave with a heavy heart after the progress made to date on our modernisation programme and especially given the significant work under way to ensure a sustainable and prosperous future for the game via the four-year strategic plan. “However, the opportunity to lead Tennis Scotland as a former player was the one job that I could not turn down. I relish the opportunity to develop and deliver the strategy and what is required. “There have been huge steps forward for tennis over the last year most notably the establishment of the new £15million Facility Fund thanks to sportscotland and the LTA.